Shaving mugs were used extensively at the turn of the 20th century in barbershops across America. They held a cake of soap that was worked up into a rich lather with a bristle brush at a time when it was commonplace for men to visit barber shops for a close straight razor shave. In many barber shops, a fitted shelf held spots for the personalized mugs of its patrons. These mugs usually had the customer's name and a hand-painted illustration of the man's occupation. The status of a barber's shop was boosted by the number of mugs on display, especially if the patrons owning those mugs were seen as influential in the community. Which Occupational Shaving Mugs Are the Most Valuable? Even the most mundane occupational shaving mugs are worth something today, and beginning collectors often start with selling in the $75 and under range. More serious collectors are willing to pay more than $1,000 for the right mugs. Those expensive mugs are general examples that have unusual occupations or noteworthy decor that is finely detailed. Occupational mugs exceeding the $1,000 mark at Morphy Auctions in were: fish market, U.S. mail truck (two different examples), race car driver (shown here), bank scene, merry-go-round, and lawyer. To see more examples with selling prices, visit the Occupational Shaving Mugs Price Guide. Are Occupational Shaving Mugs Marked? 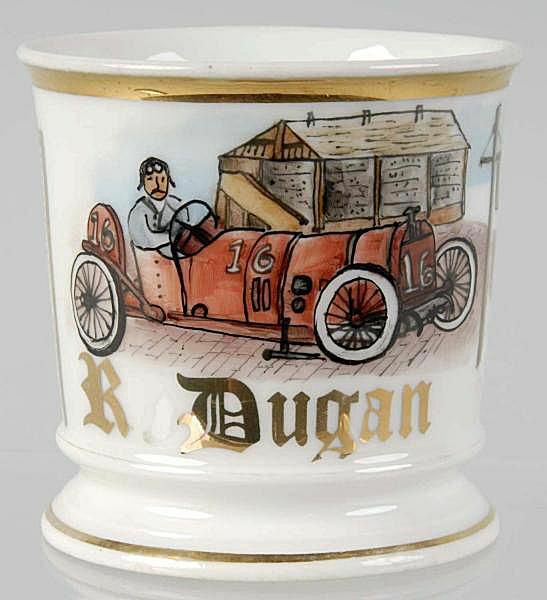 Many occupational shaving mugs will have the manufacturer's mark of the company who made the white ware, or "blank," on which the decor was painted. Most of these mugs were imported without decoration from Germany, France and other locations known for producing porcelain and then decorated in the United States. Occasionally you will find a mug that is also signed by the artist. As with most porcelain collectibles, if the artist is fairly skilled, it can add value to find one of these signed pieces. What Kinds of Condition Issues Should Beginning Collectors Look for? Of course, as with all porcelain items, it's important to inspect for chips and cracks. Other issues that can diminish the value of an occupational shaving mug are worn gold trim and lettering on names. Also look for damage such as rubs on the hand painted decor. Very rare occupations will still be worth something even with minor damage. When buying common mugs, always look for examples in excellent condition.